Store Opens – Caters to Surviving the Apocalypse! Everyone say thank you to those crazy Mayans. Not only did they give us reason to create some truly spectacular parties where hangovers and regret would never even have a chance to hit us but those forward-thinking ancient-folk are also helping build small businesses like this one in Fayetteville, New York. ‘Survival: Adventure to Apocalypse’ is a real store catering to everyone’s favorite Mayan holiday…Armageddon. Owner and lady with a name that should heave her into a television-action series soon, Calypso Ford has stocked her new business venture with everything from boots for your pets to waterproof notepads as the impending, and probably disappointing, end of the world draws to its conclusion. Ford’s store won’t carry guns or ammunition but it will carry items that would help people during something like a natural disaster. Survival: Adventure to Apocalypse will be open 7 days a week leading up the big day. We’re going to be the first in line on the 22nd for the big half-off sale. 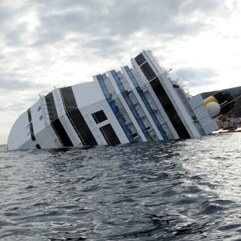 Two Swiss passengers have told a local newspaper that in the dining room of the Costa Concordia, Celine Dion’s “My Heart Will Go On” was playing when the massive ship became fatally damaged. Indeed, according to several witnesses, it seems that the music from the Titanic soundtrack, namely “My Heart Will Go On”, performed by Celine Dion, was released in a restaurant of the ship at the time of the impact. Questioned by the Tribune de Genève, Yannick Sgaga, a survivor of Switzerland and his brother Kevin have expressed their disbelief when they realized what was happening on the music of the film which told the tragedy of the Titanic occurred 100 years ago. • What a massive coincidence. • Is that song a mainstay on cruise ships? Isn’t that kind of like playing Castaway as an in-flight movie? • Billy Zane was nowhere to be seen. But if it’s true, jeez. Let’s hope someone got to paint a hot stranger naked before this all went down.